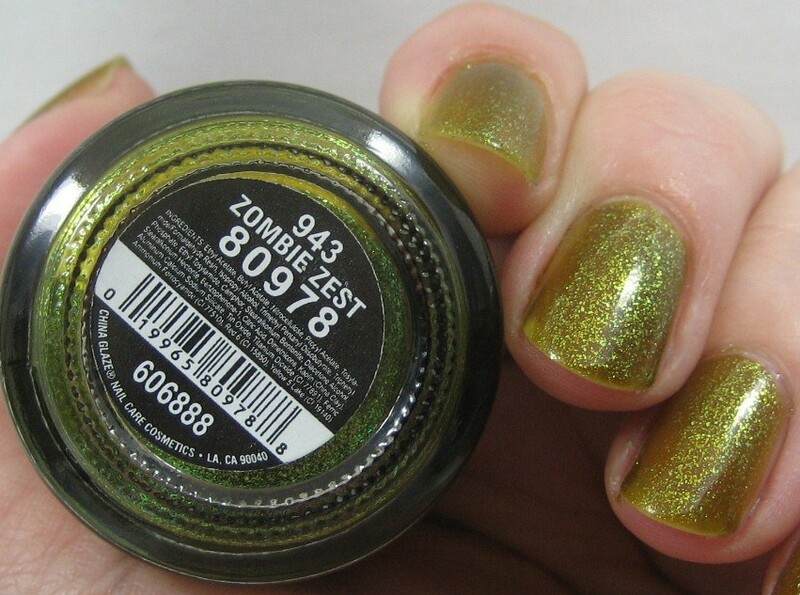 Halloween weekend I wore China Glaze Zombie Zest from the Awakening collection. It's a swampy green jelly with irregular, mostly acid green, glitter floating around in it. It's a strange color but surprisingly wearable. I used two coats; three would have been better but I was particularly impatient that day and decided I could live with a little visible nail line. When the time came to take off Zombie Zest and put on something more professional-looking for work, I went the lazy route and just applied two coats of Sally Hansen Diamond Strength in Shining Moment right on top of my existing mani then put on more top coat. 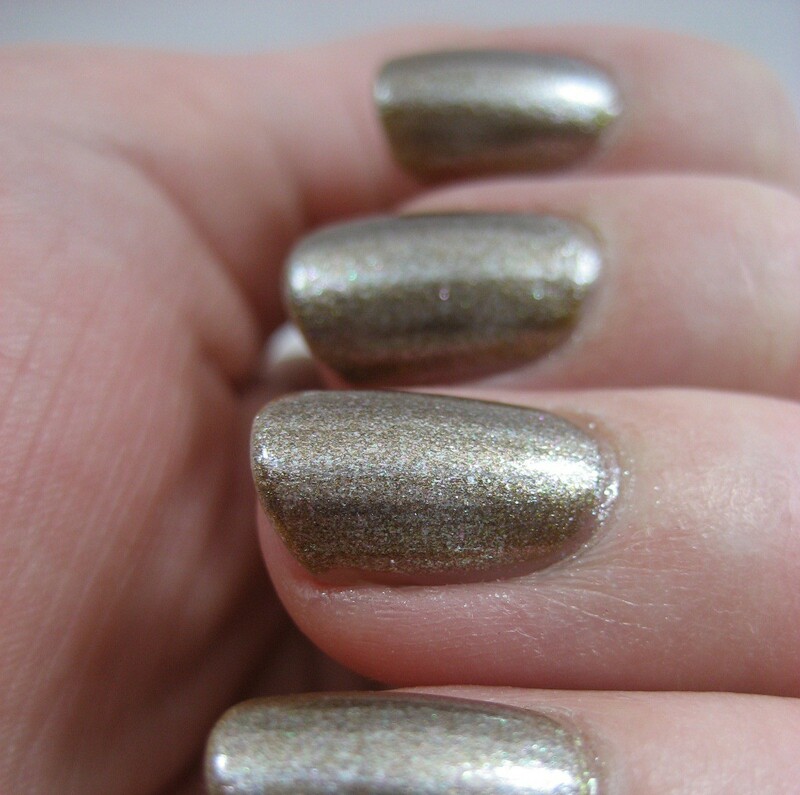 Shining Moment is a bronze-y taupe with a shimmer-verging-on-foil finish. It's opaque enough that the green underneath didn't really show through, though hints of it peeked out around the edges on some nails, but the values of the two colors were close enough to each other that they blended together rather than shouting to the world that I'd just slopped a new color on top of the old. I didn't get any pictures that showed this, but Shining Moment has tiny widely scattered flecks of multi-colored glitter in it, pink and blue and green mostly. I quite like it. I'll have to try it sometime on its own and see if not having a swamp green base makes a big difference. 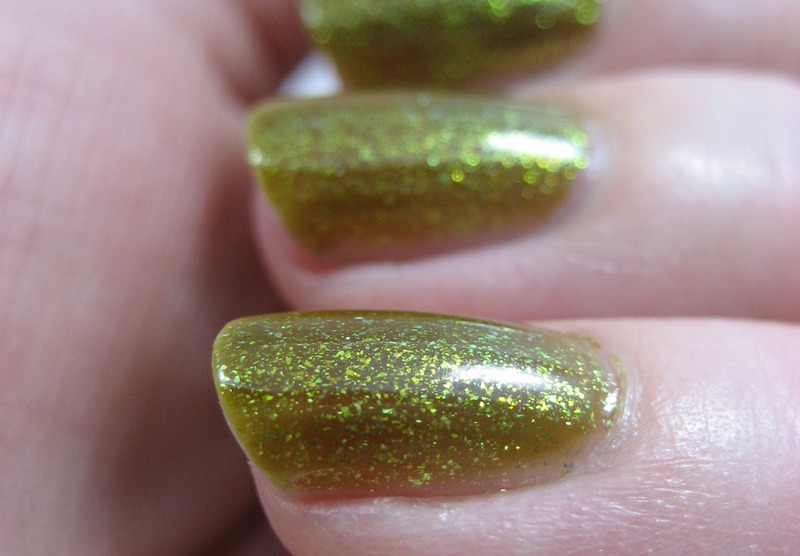 You should try ZZ over SH Sequin Scandal. It's a beautiful combo! lol, i've done that too. saves a lot of time! I am increasingly following that slothful road. It works so well! Great nails as ever, Karen. I loved Zombie Zest! Too bad you had to cover it! For some reason Shining Moment sounds familiar to me. I think I encountered it not too long ago. Too bad I didn't get it. Good idea to layer on the top, it looks good! Oh Zombie Zest looks so damn good! I think it looks better at 2 coats actually. I like the colour on top as well! 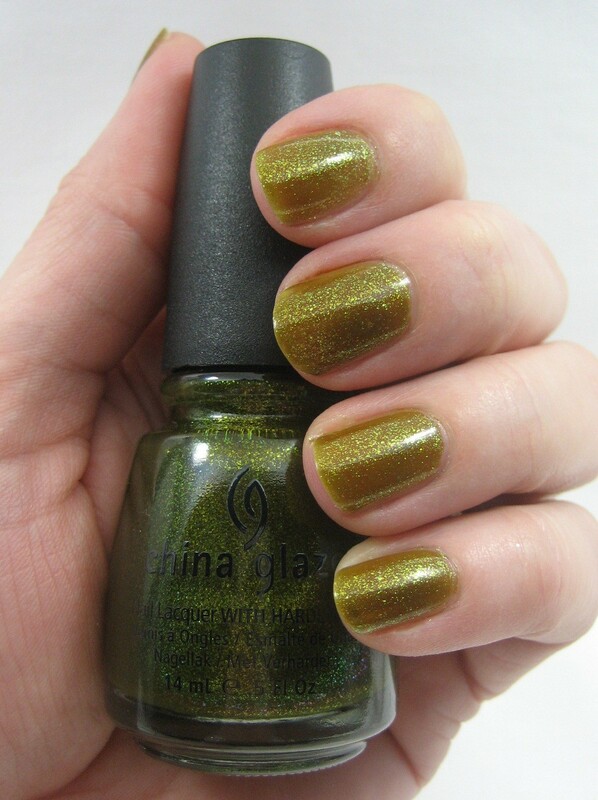 oh, I'm beginning to wonder if I shouldn't include this colour in my next polish order...??? Why, Wet 'n' Wild, Why?